Good news on the small business front. A “serial entrepreneur” with a passion for motors demonstrates an example of how to innovation can be accomplished through unlikely avenues. After presiding over the growth of a company that folded upon his departure, LC Drives CEO Russel Marvin has now brought a potential breakthrough in motor weight and size to the market. He describes the company as a “startup that developed revolutionary motors and generators from 0.2MW to 5MW” per his LinkedIn profile. LC Drives CEO Russel Marvin. 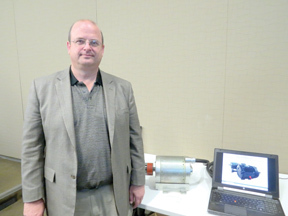 In upstate New York, his burgeoning startup business with innovative electric motor patents recently got a big lift from state funding. LC Drives, of Potsdam, was granted $300,000 in December by Empire State Development to continue the growth it has enjoyed since its inception in 2012. This time around, the money is designated for the purchase of manufacturing equipment and the formation of job positions. The company develops transformative and disruptive technologies for electrical rotating machines. It currently holds patent pending technology it claims capable of reducing output of electrical machines from 10kW to 10MW. Primary interest from the state of New York was housed in the prospect of this technology being utilized in buses, but the company’s innovative outlook could now produce much more than that. It has invested research in wind turbine generators, traction motors, and industrial applications as well. LC develops variable frequency drives, which have a wealth of applications in factory machinery and are always needed in the general manufacturing market. One third of the company’s proposed usage is expected to be channeled toward the highly segmented industrial motors market. As reported in an article on January 1st by Jimmy Lawton of local publication North Country Now, the company had originally sought $600,000 in grants from Empire State Development. NY Governor Andrew M. Cuomo announced this past month that the company would receive $300,000. Empire State Development is the umbrella organization for New York’s two principal economic development financing entities, the New York State Urban Development Corporation and the Job Development Authority. As we transition into a new era of manufacturing, it is sometimes difficult to envision how startups and small business will survive amidst a flurry of automation and specialized work. However, cases such as this give hope to the sentiments echoed by President Obama in his final State of the Union address on Tuesday night – that training for such positions needs to be emphasized and startups need to be funded. The original source of funding for the project was granted in 2014 when LC received $75,000 from the New York State Energy Research and Development Authority. This initial grant was aimed to understand the feasibility of the smaller electric motors the company had developed. “We’re a new company that has developed some interesting motor and generator technology that allows motors to be smaller. We believe that ultimately that will result in the next generation of electric motors for medium- and large-size applications,” Marvin said back in April of 2014 upon receiving the first installation of funding. Developing motors that could be half the size and weight of conventional products, LC is working on prototypes that could weigh 4 or 5 tons for wind turbines that usually require 11 or 12-ton motors. This would create savings through multiple avenues – reducing the cost of the engine as a whole, but also the overall cost of production for building a a wind tower due to the reduced weight requiring less support. The new jobs will be highly instrumental for a company that currently has only 10 full and part-time engineers and is looking for new premises to expand its existing facilities. Potsdam is located in St. Lawrence County, in the northernmost part of the state about an hour’s drive from the Canadian border and 21 miles from Adirondack State Park.